The Occupy Movement is like a disruptive startup … in the protest space. 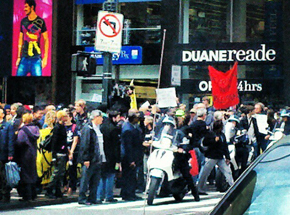 Fast Company goes in search of innovation at the May Day demonstrations. Today is May Day. Occupy Wall Street and its various splinter movements are attempting to pull off a national General Strike, with a large European-style manifestation planned for New York. For the Occupy movement, May 1 is an opportunity to reclaim the space in the public consciousness that they… well, occupied back in 2011. Massive numbers of protesters are currently on the streets, with large numbers from around the country showing up. Occupy Wall Street’s secret for the General Strike seems to be new leadership tactics and leveraging unique groups of New Yorkers such as immigrants, union members, and college students for maximum effect. The New York General Strike demonstrations, which are already the largest American May Day happenings in history, are made up of several parts. Two groups of protesters–one originating in Midtown’s Bryant Park and another from Brooklyn’s Williamsburg neighborhood–are converging in Union Square, Manhattan. From Union Square, the protesters are latching onto New York’s traditional May Day parade that continues on into the Financial District. In Madison Square Park on 23rd Street, sympathetic college professors from New York University, CUNY Graduate Center, and Columbia University are holding “teach-ins”–classes held outdoors in the park as to contravene NYPD regulations. All the classes are open to the public and a speaker list is available here [PDF]. Check out the Storify version of Neal Ungerleider’s Occupy coverage here. The Occupy organizers have set up a massive free concert in Union Square Park in order to draw maximum crowds–and create a handy, media-friendly gathering. Expected acts veer toward the hipster end of the spectrum, with Das Racist, Dan Deacon, and Immortal Technique performing. Tom Morello (Rage Against The Machine, Audioslave) and Ben Harper are leading a Occupy Guitarmy protest march as part of the larger Bryant Park contingent that will strum guitars and sing acoustic songs in a giant folk concert that will make its way to Union Square as well. More musical guests are expected at the end of the protest day, which is scheduled for tonight in front of MTA headquarters at 2 Broadway. TWU Local 100, the labor union which represents MTA employees, has been one of the most important sympathizing organizations for Occupy Wall Street. Members of TWU 100 have been working without a contract for months now, and have participated with OWS sympathizers in guerrilla actions to give straphangers free subway rides. TWU 100, who were able to legally obtain a stage and a large gathering permit in the heart of the Financial District, have essentially offered a loophole for Occupy members to gather downtown outside of Zuccotti Park. 2 Broadway is located extremely close to Battery Park, offering additional spillover space as well. In their path to make it down to 2 Broadway, Occupy has taken advantage of a traditional New York event: The annual May Day parade from Union Square to Downtown. The parade has traditionally been the domain of New York’s immigrant communities and far-left Socialist/Communist parties. 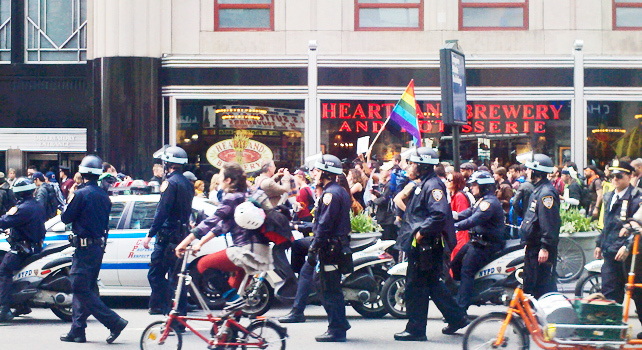 By partnering with the organizers of the May Day parade, with whom they share some common goals, Occupy was able to sidestep a significant logistical hurdle in making their way across Manhattan. Protesters and police officers have been largely peaceful. However, the author of this article saw multiple instances of police officers behaving menacingly toward peaceful protesters and of violent protesters attempting to instigate scuffles with the police. The general vibe from bypassers seems to a mix of apathy and mild sympathy. There was one exception; on Fifth Avenue, a man came out of an office building to shout “Damn Hippies!” at a crowd of a dozen passing Occupiers and then walked back inside. For OWS and their compatriots, May 1 is intended as a show of force as much as anything; after a long winter during which they disappeared from the national consciousness, Occupy is back. As for the New York Police Department, this time around they’re actually borrowing tactics from Occupy Wall Street. Protesters have noted the presence of jacketed NYPD lawyers along the parade route keeping an eye on the proceedings; National Lawyer Guild legal observers have been a regular fixture at OWS happenings in the past. The NYPD has been using other methods to regulate and control the protesters as well; large flybys of five to six blaring cop cars regularly passed by streets next to the parade/demonstration in an attempt to disrupt optics/hearing. Multiple helicopters are in the sky over Union Square and in a modified version of a counterterrorism exercise, dozens of cop cars–sirens on–suddenly converged outside of Union Square. Many badly disguised undercover police officers could also be seen on the nearby streets, and cops were also seen using a fake taxicab to unload supplies and equipment on a sidestreet off of Union Square. For more stories like this, follow @fastcompany on Twitter. Email Neal Ungerleider, the author of this article, here. Follow him on Twitter and Google+ for updates on today’s Occupy events.